Martin Seamus McFly is a fictional character and the main protagonist of the Back to the Future trilogy. He is portrayed by actor Michael J. Fox. McFly also appears in the animated series, where he was voiced by David Kaufman. In the videogame by Telltale Games, he is voiced by A.J. Locascio; in addition, Fox voiced McFly's future counterparts at the end of the game. In 2008, McFly was selected by Empire magazine as the 12th Greatest Movie Character of All Time. Marty was born in Hill Valley, California to a family of Irish descent. Little is known about Marty's life prior to the first Back to the Future film, except for the fact that he set fire to the living-room rug when he was 8 years old (which is revealed via a statement of Marty's to his future parents). He met his friend Dr. Emmett "Doc" Brown when he was around fourteen after hearing that Brown was a dangerous lunatic. Marty, being the “red-blooded American teenager” he was, wanted to go see what it was all about for himself. He found Doc’s lab and was fascinated by all his inventions. When Doc caught him, he was glad to have someone who liked his work and their friendship started there. In 1985, Marty plays guitar with his group The Pinheads and likes listening to Huey Lewis and the News, Tom Petty and the Heartbreakers, and Van Halen. He is also a talented skateboarder and proven to be an excellent pistol shot, a skill he has honed by endlessly playing shooting games such as Wild Gunman at his local 7-Eleven. Marty is a friendly, easygoing but accident-prone everyman who can sometimes lack critical thinking skills; he is nevertheless brave in the face of danger and can be very quick-witted and intelligent. He has shown some good and basic street fighting skills and often throws punches in hand-to-hand confrontations. He is loyal to his family and friends, regardless of whether or not he is estranged from them. His major character flaw is his pride, which causes him to take unnecessary risks to show others that he is not a coward. However, during a visit in 1885, when his ancestor Seamus McFly mentions that his brother Martin was killed in an argument after someone questioned his bravery, Marty begins to re-think his stance on what other people think of him. By 2015, Marty's life has spiraled out of control due to long-term pain from a hand injury that leaves him unable to play guitar. This injury occurs in 1985, after Marty accepts school enemy Douglas J. Needles' challenge to a road race and crashes into a Rolls-Royce. In 1885, Biff Tannen's great-grandfather Buford goads Marty into a showdown, which Marty wins despite refusing to draw a gun against Buford. Once he returns to 1985, he remembers both this event and Seamus' advice and declines Needles' challenge, avoiding the collision that would have ruined his musical talents. Over the years, Marty learns how to make his decisions on his own terms instead of being influenced by others, thereby changing his future for the better. 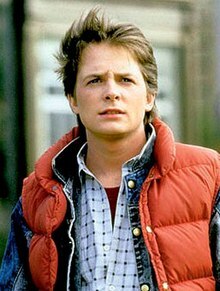 Marty McFly is the youngest of three children of George McFly and Lorraine Baines-McFly. He has a brother, Dave McFly, and a sister, Linda McFly. In addition, he has an uncle, Joey, who is serving a prison sentence in 1985 and is denied parole. Marty's secondary entourage consists of girlfriend Jennifer Parker and best friend Emmett Brown, a scientist whom Marty and Jennifer call "Doc." There is an implication that Marty is ashamed of his family and does not spend much time at home, preferring to hang out with Doc, Jennifer, or the guys in his band, The Pinheads. However, Marty's relationships with his family changed after he returns from 1955, with him no longer being alienated by his parents and his father working as a local college professor and a successful novelist in the alternate timeline he inadvertently created. Marty also meets his great-great paternal grandparents Seamus and Maggie, when he was stranded in 1885. He also meets their infant son William, Marty's great grandfather. Through his interaction with Seamus and Maggie, Marty discovers that Seamus had a brother named Martin, thus Marty's great-great granduncle. How exactly Marty and Doc met was not explained although co-writer Bob Gale provided an explanation in 2011: "For years, Marty was told that Doc Brown was dangerous, a crackpot, a lunatic. So, being a red-blooded American teenage boy, age 13 or 14, he decided to find out just why this guy was so dangerous. Marty snuck into Doc’s lab, and was fascinated by all the cool stuff that was there. When Doc found him there, he was delighted to find that Marty thought he was cool and accepted him for what he was. Both of them were the black sheep in their respective environments. Doc gave Marty a part-time job to help with experiments, tend to the lab, tend to the dog, etc.". By 2015, Marty has married his girlfriend Jennifer and they had Martin "Marty" Jr. and Marlene. ^ a b c Back to the Future (DVD). 1985. ^ Back to the Future Part II. 1989. ^ a b Back to the Future Part III. 1990. ^ "How Marty McFly and Doc Brown Became Friends". Mental Floss. 2011-08-16. Retrieved 2018-01-23.